Campus Life Magazine publishes an article by Rich Mullins. Campus Life Magazine also includes a review of "Never Picture Perfect". Rich Mullins, Rick Elias and Geoff Moore travel to Guatemala as part of an Artist Vision Trip. This trip is where Rich met Rick Elias for the first time. Rick would later become a part of Rich's Ragamuffin Band, and even produce The Jesus Record after Rich's death. Rick Elias: "We became immediate friends. We were down there for about a week and hung out constantly." Geoff Moore "We got to know each other on a mission trip to Guatemala. He and Rick Elias and I went together. I think that's where he and Rick met, and that later became part of Rich's musical landscape... I have great memories of that trip. One of the most moving musical moments of my life was watching Rich play 'Awesome God' in an orphanage on an old beat-up, out-of-tune, upright piano and listening to about three different languages singing it." Rich Mullins performs at the Meyers Sports Complext at Trinity Evangelical Divinity School in Deerfield, IL. Rich, Beaker and Bernie Sheahan visit Cincinnati on a short vacation. Bernie Sheahan: "Knowing my fondness for old train stations, Rich couldn't wait to show me the restored Cincinnati Union Terminal. With an unguarded sweetness, he picked out a just-right souvenir for me in the gift shop, a photo book on the station's history. Then it was off to the lobby to demonstrate the 'way-cool' acoustical trick involving the station's 106-foot-high rotunda. It might just be my most precious memory of Rich, hearing that gee-whiz whisper from the other side of the cavernous lobby, delighted as he was with the wonder of sound and the joy of surprising a friend. " "Somewhere" debuts on the AC Charts. It would spend 10 weeks on the chart and peak at #29. The alternative rock group the Choir performs in Wichita, KS. Rich, who had become a fan of their music, attends the show anonymously. Mark Hollingsworth: "One show was in Wichita at a second floor night club. A terrible load-in for the band and crew. Rich had become a fan of their music and showed up early to assist with all the equipment and stayed late do the same. The Choir and their crew had no idea Rich was with them, and since he was just wearing a dirty baseball cap with his hair pulled back, they never recognized him. Later, on the bus as we were headed to the next town I asked if they had enjoyed meeting Rich at all. 'He was there?!' they exclaimed. They were pissed that they never got to actually meet him, even though he'd been helping all night. Rich never went out of his way to introduce himself, even though it was his home town, and he helped fund the club where they were playing. He was just thrilled that they came to play and were making an impact on some kids he knew." Rich Mullins performs in Upland, IN at Taylor University's Rediger Auditorium. Rich is nominated for 3 Dove Awards - Song of the Year ("Awesome God"), Rock Recorded Song of the Year ("Higher Education and the Book of Love") & Inspirational Song of the Year ("Bound to Come Some Trouble"). Rich Mullins performs in Greenville, IL for the Agape Music Festival. Rich's father John Andrew Mullins, Jr dies. Rich: "My Dad was, like I said, very kind of a hard man, kind of spoke his mind, that kind of thing, and he got carbon monoxide poisoning at his work and almost died. And came back from that experience and realized that there was some real reconciliation needed between him and some of his children. And he went to one of my sisters, who was especially somewhat estranged, and really began to work on that relationship. And it was really amazing to see my Dad do. A year later, he had a stroke. He recuperated from the stroke and went back and began to work on some other relationships where there had been problems. A year later he was stung by a bee and had a-an allergic reaction. Ended up in the hospital. Came out of that. In the course of those three years, I watched God take a guy who had been a faithful Christian, but a very hard, crusty kind of Christian, and I watched God systematically take him apart. And the wonderful thing was my Dad was no less himself, but he was more himself because of what God did. And it deeply, deeply affected me because what I began to realize is, you know, God doesn't give up on us does he? That He will go to any extremes to help us become the person that He created us to be. Rich Mullins performs in Bend, OR. as part of the "World As Best As I Remember It" Summer Tour". Rich Mullins performs in Salem, OR. as part of the "World As Best As I Remember It" Summer Tour". Rich Mullins performs in Portland, OR. as part of the "World As Best As I Remember It" Summer Tour". Rich Mullins performs in Vancouver, BC. as part of the "World As Best As I Remember It" Summer Tour". Rich Mullins performs in Seattle, WA. as part of the "World As Best As I Remember It" Summer Tour". Rich Mullins performs in Spokane, WA. as part of the "World As Best As I Remember It" Summer Tour". Rich Mullins performs in Kalispell, MT. as part of the "World As Best As I Remember It" Summer Tour". Rich Mullins performs in Coure D'Alene, ID. as part of the "World As Best As I Remember It" Summer Tour". Rich Mullins performs in Lewiston, ID. as part of the "World As Best As I Remember It" Summer Tour". Rich Mullins performs in Boise, ID. as part of the "World As Best As I Remember It" Summer Tour". Rich Mullins performs in Twin Falls, ID. as part of the "World As Best As I Remember It" Summer Tour". Rich Mullins performs in Idaho Falls, ID. as part of the "World As Best As I Remember It" Summer Tour". Rich Mullins performs in Salt Lake City, UT. as part of the "World As Best As I Remember It" Summer Tour". Rich Mullins performs in Grand Junction, CO. as part of the "World As Best As I Remember It" Summer Tour". Rich Mullins performs in Vail, CO. as part of the "World As Best As I Remember It" Summer Tour". 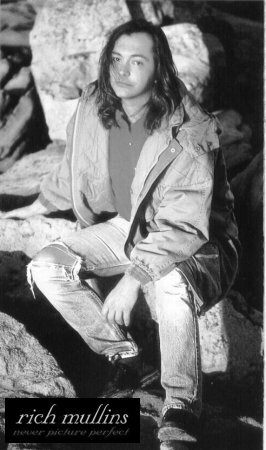 Rich Mullins performs in Colorado Springs, CO. as part of the "World As Best As I Remember It" Summer Tour". Rich Mullins performs in Topeka, KS. as part of the "World As Best As I Remember It" Summer Tour". Rich Mullins performs in Omaha, NE. as part of the "World As Best As I Remember It" Summer Tour". Rich Mullins performs in Des Moines, IA. as part of the "World As Best As I Remember It" Summer Tour". Rich Mullins performs in Minneapolis, MN. as part of the "World As Best As I Remember It" Summer Tour". Rich Mullins performs in Duluth, MN. as part of the "World As Best As I Remember It" Summer Tour". Rich Mullins performs in Green Bay, WI. as part of the "World As Best As I Remember It" Summer Tour". Jimmy Abegg releases Entertaining Angels on Sparrow Records. Rich Mullins performs in Madison, WI. as part of the "World As Best As I Remember It" Summer Tour". Rich Mullins performs in Milwaukee, WI. as part of the "World As Best As I Remember It" Summer Tour". Rich Mullins performs in Rockford, IL. as part of the "World As Best As I Remember It" Summer Tour". Rich Mullins performs in Fort Wayne, IN. as part of the "World As Best As I Remember It" Summer Tour". 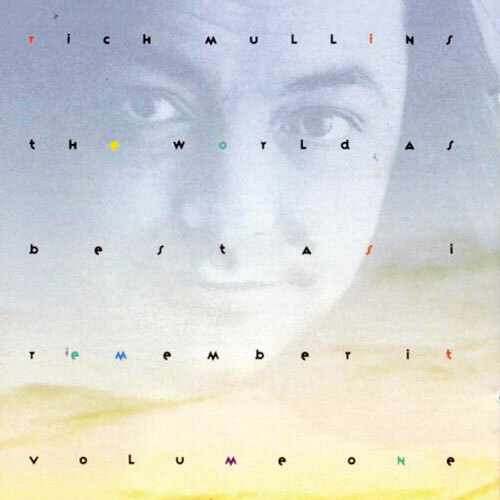 Rich Mullins fifth album, The World As Best As I Remember It, Volume One is released on Reunion Records. The album received spot number 7 in the 2001 book CCM Presents: The 100 Greatest Albums in Christian Music. The song became Rich's fifth #1 single. "The River": An early alternate title for the song was "Closer than We Know." Rich Mullins performs in Bowling Green, KY. as part of the "World As Best As I Remember It" Summer Tour". Rich Mullins performs in Lexington, KY. as part of the "World As Best As I Remember It" Summer Tour". Rich Mullins performs in Dayton, OH. as part of the "World As Best As I Remember It" Summer Tour". Rich Mullins performs in Indianapolis, IN. as part of the "World As Best As I Remember It" Summer Tour". Rich Mullins performs in Richmond, IN. as part of the "World As Best As I Remember It" Summer Tour". Rich Mullins performs in Charleston, WV. as part of the "World As Best As I Remember It" Summer Tour". Rich Mullins performs in Roanoke, VA. as part of the "World As Best As I Remember It" Summer Tour". Rich Mullins performs in Richmond, VA. as part of the "World As Best As I Remember It" Summer Tour". Rich Mullins performs in Washington DC. as part of the "World As Best As I Remember It" Summer Tour". Rich Mullins performs in Baltimore, MD. as part of the "World As Best As I Remember It" Summer Tour". "Boy Like Me, Man Like You" debuts on the AC Charts. It would spend 14 weeks on the chart and peak at #1 on September 16, 1991. Rich Mullins performs in Salem, NJ. as part of the "World As Best As I Remember It" Summer Tour". Rich Mullins and Beaker perform in Houston, TX. as part of the "World As Best As I Remember It" Summer Tour". Rich Mullins performs in Boston, MA. as part of the "World As Best As I Remember It" Summer Tour". Rich Mullins performs in Manchester, NH. as part of the "World As Best As I Remember It" Summer Tour". Rich Mullins performs in Burlington, VT. as part of the "World As Best As I Remember It" Summer Tour". Rich Mullins performs in Bowling Troy, NY. as part of the "World As Best As I Remember It" Summer Tour". Rich Mullins performs in Utica, NY. as part of the "World As Best As I Remember It" Summer Tour". Rich Mullins performs in Buffalo, NY. as part of the "World As Best As I Remember It" Summer Tour". Rich Mullins performs at Faith Memorial Church in Sandusky, OH. as part of the "World As Best As I Remember It" Summer Tour". Rich Mullins performs in Detroit, MI. as part of the "World As Best As I Remember It" Summer Tour". Rich Mullins performs in Grand Rapids, MI. as part of the "World As Best As I Remember It" Summer Tour". Rich Mullins performs in Sault St. Marie, MI. as part of the "World As Best As I Remember It" Summer Tour". CCM Magazine reviews Rich's performance at the Agape Music Festival from May 3, 1991. Rich Mullins performs in Tulsa, OK. as part of the "World As Best As I Remember It" Summer Tour". Rich Mullins performs in Dallas, TX. as part of the "World As Best As I Remember It" Summer Tour". Rich Mullins performs in Austin, TX. as part of the "World As Best As I Remember It" Summer Tour". "Boy Like Me, Man Like You" hits #1 on the AC Charts. After its debut on July 15, the song would stay on the chart for 14 weeks. CCM Magazine Reviews Rich's "The World As Best As I Remember It, Volume One." Rich Mullins performs in Tulsa, OK.
Rich Mullins performs in Emporia, KS. Rich Mullins performs in Manhattan, KS. Rich Mullins performs in Kansas City, MO. Rich Mullins and Band perform in St. Charles, MO. at First Baptist Church of Harvester. Rich Mullins performs in Joplin, MO. Rich Mullins performs in Cape Girardeau, MO. Rich Mullins performs in Memphis, TN. Rich Mullins performs in Nashville, TN. Rich Mullins performs in Grayson, KY.
Rich Mullins performs in Centerville, OH. Rich Mullins performs in Johnson City, TN. Rich Mullins performs in Knoxville, TN. Rich Mullins performs in Greenville, SC. Rich Mullins performs in Winston Salem, NC. Rich Mullins performs in Lynchburg, VA.
Rich Mullins performs in Lexington, KY.
Rich Mullins performs in Marlon, IN. Rich Mullins performs in Richmond, IN. "Where You Are" debuts on the AC Charts. It would spend 13 weeks on the chart and peak at #3. Rich Mullins performs in Evansville, IN. Rich Mullins performs the McKinley Foundation (Church) in Urbana, IL. Rich Mullins performs in Bloomington, IN. Rich Mullins performs in Detroit, MI. Rich Mullins performs in Kankakee, IL. Rich Mullins performs in Birmingham, AL. Rich Mullins performs in Atlanta, GA.
Rich Mullins performs in Columbia, SC. Rich Mullins performs in Raleigh, NC. Rich Mullins performs in Columbus, OH. Rich Mullins performs in Indianapolis, IN. Rich Mullins performs in Dayton, OH. Rich Mullins performs in Pittsburgh, PA.
Rich Mullins performs in Lewisberg, PA.
Rich Mullins performs in Philadelphia, PA.
Rich Mullins performs in New York, NY. Rich Mullins performs in Salem, NJ. Rich Mullins performs in Bloomfield, CT.
Rich Mullins performs in Boston, MA. Rich Mullins performs at New Life Ministries in Schenectady, NY. Rich Mullins performs in Buffalo, NY. Rich Mullins performs in Warren, PA.
Rich Mullins performs in Toledo, OH. Rich Mullins performs in South Bend, IN.